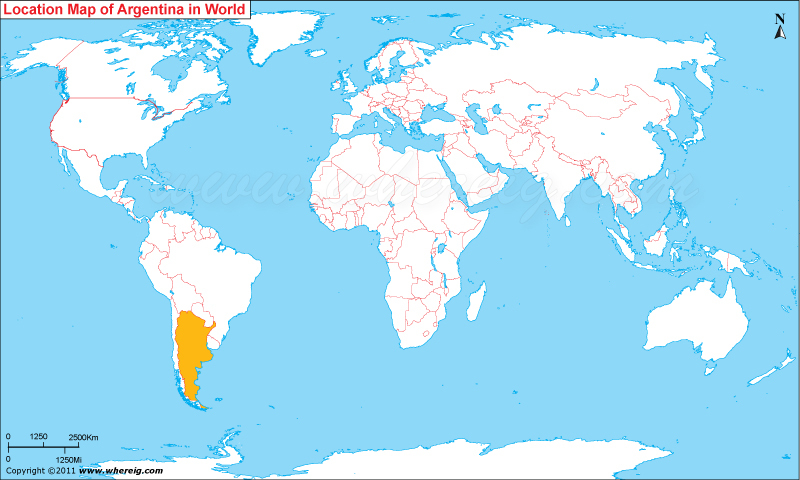 About Map: Map showing location of Argentina in the World. Argentina, is the second largest country in South America, constituted as a federation of 23 provinces and an autonomous city, Buenos Aires. Argentina is bordered by Chile, Bolivia, Paraguay, Brazil, Uruguay and the Atlantic Ocean. It is the eighth-largest country in the world by land area and the largest among Spanish-speaking nations, though Mexico, Colombia and Spain are more populous. Argentina's continental area is between the Andes mountain range in the west and the Atlantic Ocean in the east. Buenos Aires: place of assorted quintessence of the Argentinean culture. Iguazu Falls : The falls is often called as the gateway to Argentina. Taller than the Niagara, it is an amazing sight to experience tons of water throwing themselves over the cliffs. Mendoza : Medoza is the ideal destination for the lovers and admirers of wine and food. It also offers remarkable sights in and around the Andes Mountains, which is also a known destination for adventure sports.